I know there has been some controversy about canned tuna recently due to the fact that no tuna is now canned in Australia. If you wish to store a substitute (canned ham etc), please do so. There are no hard and fast rules about this storage as long as you are storing something. The Tuna is about storing a protein. Something that will go with pasta sauce and pasta, or will be quick and easy with canned veggies if you need to. You can eat it cold, you can heat it up it's pretty versatile. If you want variety, try storing different flavoured tuna. You can get tuna in spring water, tuna in oil and tuna in brine. For a very easy food storage meal, combine two small cans of tuna in tomato and onion with half a packet of cooked pasta. Grate a little tasty cheese over the top (if you have it) and perhaps any green herbs you have in your garden, and there you go. A cheap and easy meal. I'll be completely honest with you here. I really dislike Mac and Cheese. It is like cardboard food to me and I would rather make it from scratch (and do, but I add onion, bacon and tomato in layers of pene pasta...). However, I did store some and when my Husband and I needed to use our food storage, it was cheap, quick and easy to make up and I ate it gladly. It does fill you up, and that's what you're after. 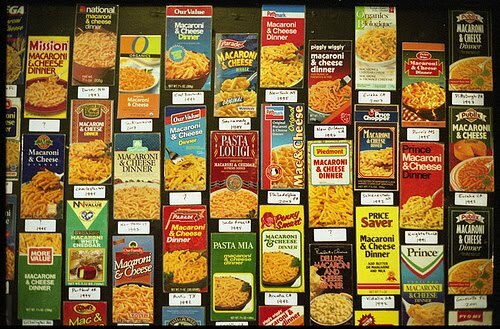 For variety, you could store a different pasta and sauce mix. You can get Pasta Carbonara, Sour Cream and Chives, Bacon flavoured Mac and Cheese, even pene and sauce sachets. It's up to you what you store for this challenge, so long as you and your family would eat it.